On late night TV, Sean Spicer is a punchline. On cable news, he's a punching bag. In the briefing room, he's punching back. Spicer is still a brand new White House press secretary, but his fate has already become a parlor game in media and political circles. He has been placed in nearly impossible positions by his boss, President Trump, and has been hammered for making inaccurate and illogical statements. Thursday may have been his rockiest briefing yet. He repeatedly dismissed questioners and shut down one line of inquiry by saying "this is the silliest thing I've ever heard." The Washington Post said Spicer "went full Melissa McCarthy" -- referencing McCarthy's scathing impersonation from last weekend's "Saturday Night Live." The McCarthy sketch has inspired thousands of social media memes and derisive jokes about Spicer. Fans of the show are wondering whether she'll be back on this weekend's episode. Vanity Fair, no friend of the Trump administration, put it this way: "He has, in some ways, become Trump's very own Baghdad Bob," the Iraqi Minister of information who denied the U.S. had invaded Iraq even as the tanks were rolling nearby. On Wednesday Spicer shocked observers by saying that the recent Yemen raid was "obviously a huge success" and that "anyone who suggests it was not a success does a disservice" to William "Ryan" Owens, the Navy SEAL who was killed during the mission. Three more SEALs were wounded and a number of civilians were killed. On the same day, Spicer was also was scrutinized for saying, on three separate occasions over two days, that there was an unspecified terror attack in Atlanta. There wasn't. On Thursday, an administration official said he'd meant to say Orlando. Spicer has come under withering criticism in recent days, and some of the criticism has reportedly come from the president. Citing a source familiar with internal communications, CNN's Jim Acosta reported on Tuesday that Trump "is disappointed in Spicer's performance during the first two weeks of the administration." Furthermore, Acosta reported, the president was not amused by McCarthy's impersonation. With tongues wagging about Spicer's status, Trump senior advisor Kellyanne Conway expressed support for him on Thursday morning, saying on Fox News that "the truth is, Sean Spicer is our press secretary and will continue to be. He has the president's ear and his full confidence." Spicer did not respond to a request for comment for this story. 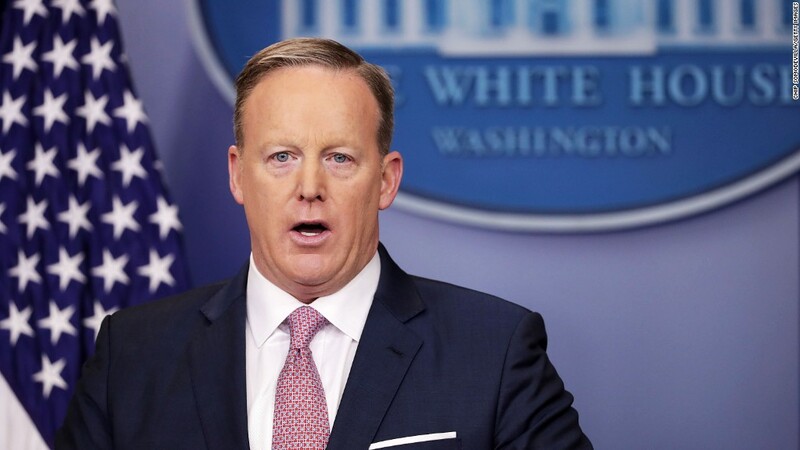 Although well-liked by reporters and politicos, Spicer has surprised many White House correspondents with his combative and sometimes downright hostile approach at press briefings and in private conversations. He may just be channeling the president, who has been attacking the media on a daily basis in tweets and during public events. Spicer began his tenure as press secretary by delivering a five-minute statement about what he called "deliberately false reporting" by members of the media. While some Trump loyalists cheered the angry statement, the incident hurt Spicer's credibility with the press corps. In the weeks since, Spicer has cherry-picked errors by news outlets and iced out some journalists. "They are in the bunker. Already. Usually it takes months or years for a White House to go there. It took these guys a few days," a veteran White House correspondent said on condition of anonymity. Every press secretary faces an adversarial press corps; that's why every person to hold the job passes on a flak jacket to his or her successor. It's been a running joke since the 1970s. But tensions are running particularly high right now. Spicer has repeatedly called for individual journalists to apologize for mistakes. At the same time, Spicer himself has misspoken on several occasions. While some slip-ups, like confusing Atlanta with Orlando, are merely embarrassing, others can have real consequences given the prominence of his position. After the Yemen raid, Spicer said at a press briefing that "no American citizen will ever be targeted," a slip-up that would have amounted to a major change in U.S. policy. Anwar al-Awlaki, an American citizen, was specifically targeted and killed in a drone strike in 2011. And last month he twice referred to "Palestine" during a briefing, wording that in a different administration might have provoked a rebuke from Israel. To Spicer's credit, he is taking questions at his briefings from a wide range of news outlets, including from journalists in other cities via Skype. And he is working double duty as both on-camera spokesman and as Trump's communications director. The jobs are normally held by two different people. Acosta reported that the White House is ramping up its search for a communications director. But there may be no communications solution to Spicer's problem. Late night talk show hosts have been having a field day with him. Stephen Colbert recently treated Spicer especially harshly, calling him an "angry neck with ears." And Jimmy Kimmel has introduced a recurring bit on his show: "Drunk Sean Spicer."